The Tameside is a borough lying seven miles east of Manchester in the northwest region of England. The region is home to just under 215,000 people living within its 40 square miles. · Posters highlighting government and community programs, services, and projects. From this central hub, visitors can tour virtual council offices, a garden area, a demonstration of street services, a water-related museum and a stadium for events. An aquifer museum offers information about a community’s water supply and system. Here a visitor can view a water wheel exhibit and a lecture chamber. 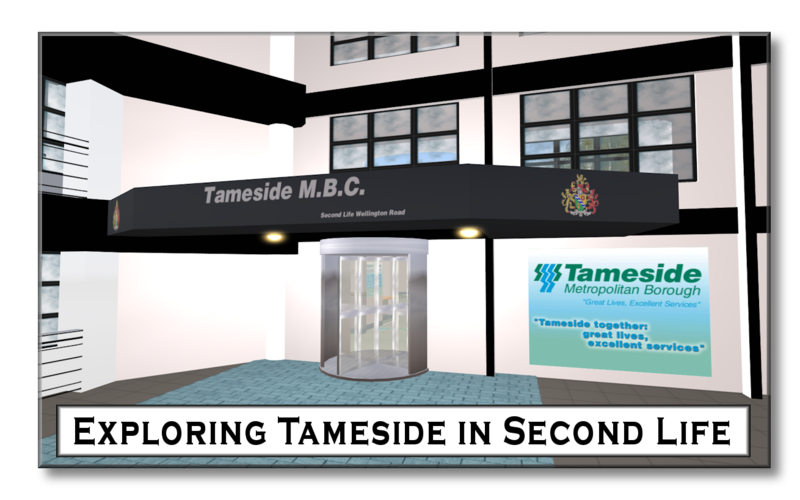 In the northern end of the sim, a representation of Tameside offices are located within a white two-story government building. Those strolling the street in the services area will find signs, drains, garbage cans, and other items typically located along a typical residential street. Each item is linked to the Tameside Streetscene System website. Here residents can report issues that need to be addressed in their neighborhoods. Note: This sim was removed from the grid in April 2010 and is no longer available.